The surtaxed, or "semi-postal", pictorial French stamps of 1938-1939 featured famous Frenchmen and important contemporary events, and their sale provided badly needed funds for national defense projects and public charities. The two pictorial stamps shown above (Y&T #377-77A, Sc. #B68-69) were issued during 1938 and 1939. The surtax on these stamps was for the benefit of French seamen. 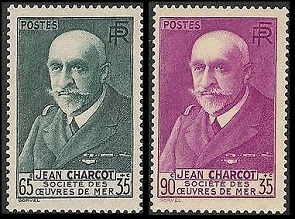 The common design of these two stamps features a portrait of Jean-Baptiste Charcot (1867-1936), a French scientist, physician, and polar explorer. The 1.75 Fr. + 75 C. denomination pictorial French stamp shown above, at the left (Y&T #379, Sc. #B70), was issued on May 9, 1938 to publicize the National Exposition of Painting and Sculpture at Versailles. The surtax benefited the Versailles Concert Society. The design features a view of the Palace of Versailles. The 1.75 Fr. + 50 C. denomination commemorative stamp shown above, at the right (Y&T #402, Sc. #B76), was issued on September 1, 1938 to commemorate the 40th Anniversary of the Discovery of Radium. The surtax benefited the International Union for the Control of Cancer. The design features Pierre Curie (1859-1906) and Marie Curie (1867-1934), World famous French Physicists. Marie Curie, along with her husband, pioneered the study of radioactivity. She also discovered two elements, Polonium and Radium. She was the first woman to win the Nobel Prize, the only person to ever win the Nobel Prize TWICE, and the only person to win the Nobel Prize in two different sciences, with them being Physics and Chemistry. She was also the first woman to become a professor at the University of Paris and the first woman to be entombed, based on her own merits, in the Pantheon in Paris. The two pictorial stamps shown above (Y&T #386-87, Sc. #B71-72) were issued on May 16, 1938. 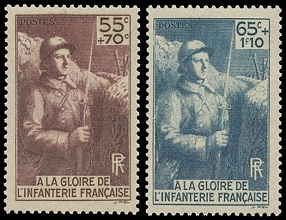 The surtax on these stamps was for the erection of a monument dedicated to the Glory of the French Infantry. The 65 C. + 35 C. denomination commemorative French stamp shown above, at the left (Y&T #403, Sc. #B77), was issued on October 8, 1938 to celebrate the 20th Anniversary of the Armistice that ended World War I on "the Eleventh Hour of the Eleventh Day of the Eleventh Month" in 1918. The design features the victory parade passing the Arc de Triomphe in Paris. The 90 C. + 25 C. denomination pictorial stamp shown above, at the right (Y&T #418, Sc. #B79), was issued during December 1938. The surtax was used to help provide Radios for the Blind. The design features a blind man listening to a radio. The 90 C. + 35 C. denomination pictorial French stamp shown above, at the left (Y&T #420, Sc. #B80), was issued on February 1, 1939. The surtax used to erect a monument honoring the Civilian Victims of World War I. The design features a civilian facing a firing squad. The 90 C. + 35 C. denomination commemorative stamp shown above, at the right (Y&T #422, Sc. #B81), was issued on March 24, 1939 to celebrate the 75th Anniversary of the International Red Cross Society. The surtax benefited the International Red Cross. The design features a nurse. The 70 C. + 50 C. denomination pictorial French stamp shown above, at the left (Y&T #423, Sc. #B82), was issued on April 3, 1939 to honor the Army Engineering Corps. The surtax was for the erection of a monument dedicated to the Army Engineers that Died in World War I. The 90 C. + 35 C. denomination pictorial stamp shown above, at the right (Y&T #424, Sc. #B83), was issued on April 8, 1939 to celebrate the Opening of the new headquarters building for the French Ministry of Post, Telegraph, and Telephone. The surtax was used for aid to orphans of employees of the P.T.T. The 90 C. + 35 C. denomination pictorial French stamp shown above, at the left (Y&T #428, Sc. #B84), was issued on April 24, 1939. The surtax was to aid Children of the Unemployed. The design features a mother and child. The 90 C. + 50 C. denomination commemorative stamp shown above, at the right (Y&T #429, Sc. #B85), was issued on May 5, 1939 to celebrate the 50th Anniversary of the Eiffel Tower. The surtax was used for celebration festivities. The 55 C. + 45 C. denomination charity stamp shown above (Y&T #395, Sc. #B73) was issued on May 25, 1938. The surtax was for a fund to erect a monument honoring the Army Medical Corps in Lyon. The 65 C. + 35 C. denomination commemorative stamp shown above (Y&T #399, Sc. #B74) was issued on July 10, 1938 to celebrate the Completion of the Reconstruction of Reims Cathedral. Reims Cathedral, one of the most important historical and cultural landmarks in France, was severely damaged by German shelling and subsequent fires during World War I. The reconstruction took from 1919 to 1938, during which time the Cathedral was closed to the public. It was reopened on Sunday, July 10, 1938, though some restoration efforts are still in progress to this date. Miraculously, the Cathedral of Reims was not damaged during World War II. The 65 C. + 60 C. denomination charity stamp shown above (Y&T #401, Sc. #B75) was issued on August 8, 1938. The surtax benefited French volunteers returning from the Spanish Civil War. The design features an allegorical representation of "France Welcoming Her Sons". The 65 C. + 60 C. denomination charity stamp shown above (Y&T #417, Sc. #B78) was issued on December 1, 1938. The surtax was for Student Relief. The design features a student and a nurse.